Brian G. Hedges : Jonathan Edwards on "Man's highest happiness"
Jonathan Edwards on "Man's highest happiness"
"Man's highest happiness consists in holiness. It is by this the reasonable creature is united to God, the fountain of all good. Happiness does so essentially consist in knowing and loving and serving God, and having a holy and divine temper of soul, and the lively exercises of it, that those things will make a man happy without anything else. But no other enjoyments or privileges whatever will make a man happy without this." Jonathan Edwards, Charity and Its Fruits, Sermon 2, Point III, Section 5. Ethical Writings, Ed. 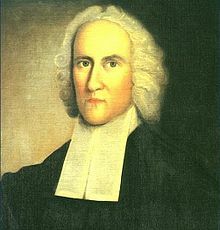 Paul Ramsey, The Works of Jonathan Edwards, vol. 8. New Haven, Conn. Yale University Press, 1989, p. 161.